產品上架時間 2015 十月 06 週二. 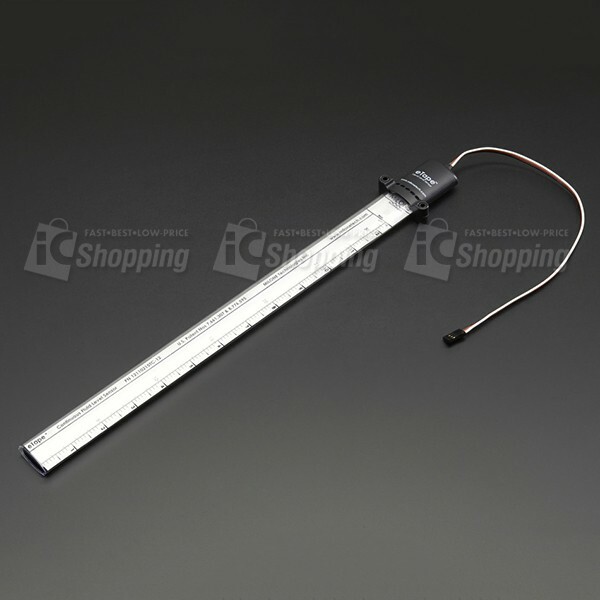 This eTape Liquid Level Sensor is a solid-state sensor with a resistive output that varies with the level of the fluid. It does away with clunky mechanical floats, and easily interfaces with electronic control systems. What separates this from our other eTape Liquid Sensor is the hard plastic jacket that makes it less susceptible to damage. The eTape sensor's envelope is compressed by the hydrostatic pressure of the fluid in which it is immersed. This results in a change in resistance that corresponds to the distance from the top of the sensor to the surface of the fluid. The sensor's resistive output is inversely proportional to the height of the liquid: the lower the liquid level, the higher the output resistance; the higher the liquid level, the lower the output resistance. This is a very unique sensor, we haven't seen anything else that is affordable and accurate for measuring liquid level. This particular sensor is the 12" model. It comes with a 3-pin JST connector. Note: This product only comes with the plastic enclosed eTape Liquid Level Sensor. In our demo, we set it up with an Adafruit Metro, a TB6612 Stepper Motor Driver Breakout Board, and an Automotive Gauge Stepper Motor. 305mm x 29mm x 13mm / 12" x 1.14" x 0.51"
Actuation Depth: Nominal 25.4mm / 1"